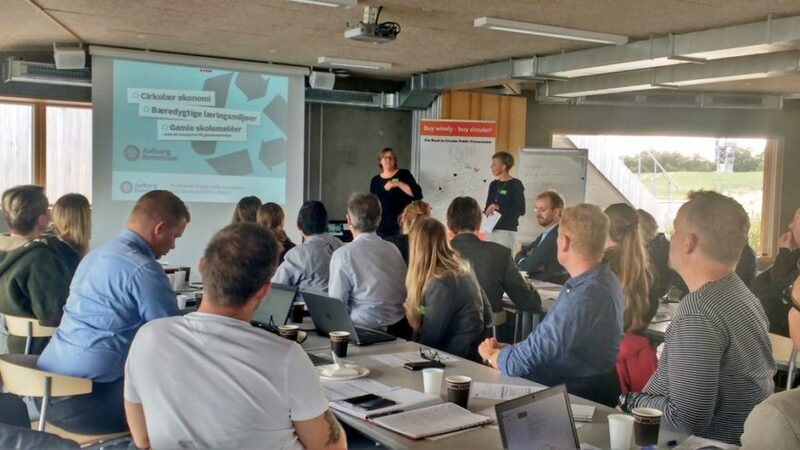 On September 25th, the City of Aalborg held a workshop to introduce the concept of circular procurement to just under 30 participants, including project leaders, procurers and environmental experts from several departments within the City, as well as other business and social organisations in the Aalborg area. The day was kicked off by Michael Damm, Environmental Director at the City of Aalborg, who set out the vital role that cities like Aalborg can play in meeting environmental challenges through their public procurement. The Circular PP project and Aalborg’s planned procurement pilots in playgrounds and lifetime extension of ICT were also introduced, followed by a presentation by external experts from ICLEI and PIANOo, who introduced the principles and process for conducting circular procurement, and demonstrated a range of good practice already being implemented. Presentations were also given by legal firm Tolstrup and Hvidsted and the City of Aalborg on how the Danish legal framework and Aalborg’s policy framework can be used to support circular procurement. In addition, in order to prove that circular procurement is already possible in Aalborg, two local businesses – Højer Møbler (a furniture designer and manufacturer) and Aage Vestergaard Larsen (a plastics recycler) – came to share their stories about how they are already making a circular economy a reality in the city, and Aalborg’s previous experience in circular procurement through their school furniture purchase was presented. This tender (which was won by Højer Møbler) has since won the IKA (Danish Association of Public Procurement) award for Denmark’s Best Call for Tender 2017, is shortlisted for the Procura+ ‘Sustainable Tender of the Year’ award (announced 4th October 2018) and has been featured as a good practice case study by the European Commission’s GPP News Alert. At the heart of the day was an interactive workshop, where experts from Aalborg, ICLEI and PIANOo brainstormed how to take forward circular procurement pilots as part of Circular PP. Opportunities and challenges were identified, current knowledge about the market swapped, and tactics for moving forward and collaborating with the market and other internal stakeholders discussed. The day was wrapped up with a presentation from the North Denmark EU Office (EENA) on the ‘7 Step Plan’ for increased market involvement – the first step of which had been completed the previous week as a part of Aalborg’s Sustainability Festival (see here). Overall, the day was a chance to share knowledge and address mindsets around how cities purchase, and was a positive step forward towards Aalborg’s goal of conducting two circular public procurement pilots as part of the Circular PP project. Error: Error validating access token: Session has expired on Saturday, 02-Feb-19 00:26:15 PST. The current time is Thursday, 25-Apr-19 13:00:04 PDT.